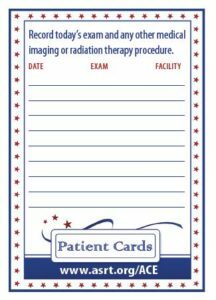 EngagingPatients.org Radiologic Technologists Look to ‘ACE’ Patient Engagement - Welcome to EngagingPatients.org! Greater understanding and trust between provider and patient begins with clear and simple communication. For radiologic technologists, clear and precise communication plays a crucial role in making sure patients receive the best care possible. 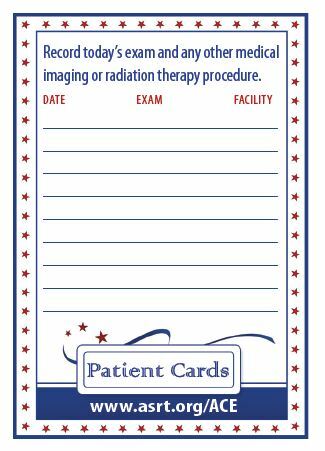 Enhancing their communication skills is an ongoing goal for all radiologic technologists and many have adopted the ACE protocol as a key tool in their daily interactions with patients. 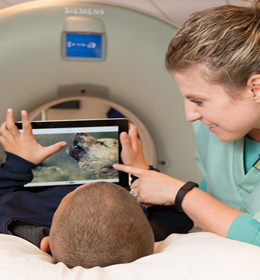 Developed by the American Society of Radiologic Technologists for use in clinical settings, ACE offers three easy steps to connect quickly and authentically with patients. 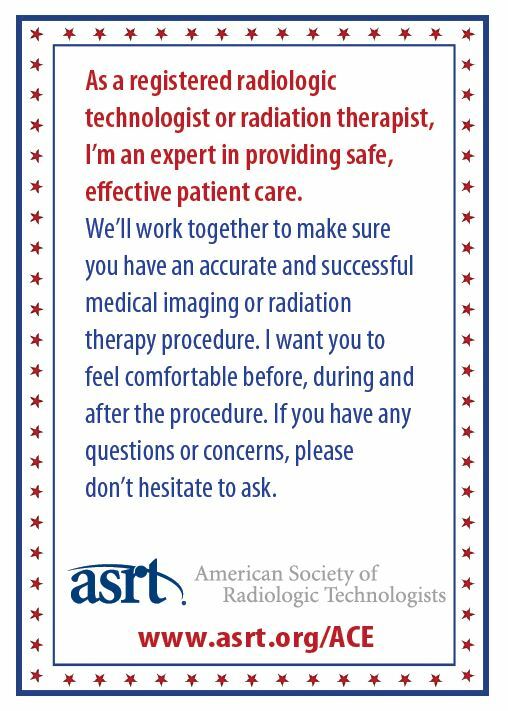 With more than 153,000 members, ASRT is the world’s largest medical imaging and radiation therapy association. Radiologic technologists are the medical personnel who perform diagnostic imaging examinations and administer radiation therapy treatments. Educated in anatomy, equipment protocols and radiation protection measures, radiologic technologists play a vital role in patient care and safety. The ACE protocol works to open up communication between patients and providers. Technologists clearly communicate to every patient that they’re an expert in radiologic procedures and that their work is central in the effort to diagnose or rule out disease or injury. As a registered radiologic technologist or radiation therapist, I’m an expert in providing safe, effective patient care. We’ll work together to make sure you have an accurate and successful medical imaging or radiation therapy procedure. I want you to feel comfortable before, during and after the procedure. If you have any questions or concerns, please don’t hesitate to ask. Keep patients safe and comfortable. Provide them with an accurate exam or treatment. Answer questions and address concerns. Treat every patient as they would a member of their own family. When communication follows the ACE protocol, patients feel increased confidence in the radiologic technologist. It helps to build trust and allay patient anxieties. Some patients may not be aware of the important role medical imaging and radiation professionals play in their total care. They may not know that positioning, radiation safety measures and other considerations can make or break a diagnostic image -– or expose a patient to unnecessary amounts of ionizing radiation. That’s why technologists seek to engage their patients by taking a moment to lay out their education and qualifications and explain just how the exam will proceed. We realize that some procedures may cause discomfort and can even be confusing. Patients who are well informed about the procedures can feel more in control of their care and more assured of a successful outcome. When individuals participate in their own health care and feel empowered to make informed decisions, the result is often better outcomes. This pledge opens the door to improved communication and enhanced patient engagement. ACE is a winning hand for the provider and the patient. It’s an easy-to-remember acronym for medical imaging and radiation therapy professionals, and an opportunity for patients to get and stay connected to their own health care decisions. Sal Martino, Ed.D., R.T.(R), FASRT, FASAE, CAE, is CEO and Executive Director of the American Society of Radiologic Technologists. 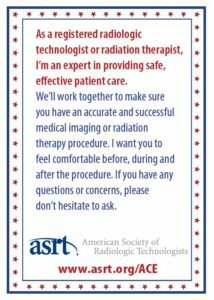 ASRT is the world’s largest medical imaging and radiation therapy association with more than 153,000 members. Born and raised in Brooklyn, with a doctorate from Columbia University, Martino is a fellow of the American Society of Association Executives and serves as chair-elect of the ASAE board of directors.